GOLETA, CA…The Santa Barbara Ranger District will host two public events at the Los Prietos Station on Paradise Road this Saturday, April 30, and Sunday, May 1. 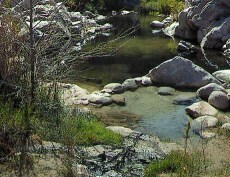 On Saturday from 9 a.m. to 4 p.m., a new display of local fish and animal species as well as historical artifacts from the early day of Los Padres National Forest will be unveiled as part of “Forest Appreciation Day.” Visitors are encouraged to stop in and learn more about district ecology and the Santa Ynez River Valley. On Sunday from 11 a.m. to 3 p.m., a “Get to Know Your Forest Day” event co-sponsored by Los Padres Forest Association will feature interactive booths on subjects ranging from geology and fire to backpacking and watersheds. A series of live demonstrations will cover topics such as mule packing, fire engines, the importance of public lands and volunteering, and light backpacking. Thanks to the donated aquariums from the Santa Barbara Zoo, Los Padres is able to put many of the fish and animal species on display that were rescued following this winter’s extensive rains, and are being rehabilitated for release into the wild. Among the critters visitors may encounter in the new exhibit are garter snakes, lizards, fish, a tarantula, tadpoles, and butterflies. For more information, call the Santa Barbara Ranger District at (805) 967-3481.